Thank You for supporting the collection drive for Leh. In case of any queries, please feel free to email us. We are working with Pankhudi Foundation (www.pankhudifoundation.org) to run this collection drive in 5 cities. All contributions will be sent to GOONJ (www.goonj.org) for further distribution in Leh. GOONJ is a recognized non-profit with initiatives running across 20 states in India and several awards to their credit including ‘Indian NGO of the year’ in 2008. They played a huge role in bringing relief to the victims of the Bihar Floods in 2008 and the Karnataka and Andhra Floods in 2009. After sending your contributions, please inform us at rashmi.borole@gmail.com / yatin.sethi@gmail.com so that we can keep track and update your names in the DONOR LIST on our facebook page. 1) Send a Cheque/Demand Draft by post to this address: GOONJ, J-93, Sarita Vihar, New Delhi-110076. INDIA. Tel.- 011-26972351, 41401216. Please mention your Name, Address, Phone no and PAN no behind the cheque for accounting purposes. 1) Send a Cheque by post (from a bank in India or abroad). Post the cheque to GOONJ, J-93, Sarita Vihar, New Delhi-110076. INDIA. Tel.- 011-26972351, 41401216. Please mention your Name, Address, Phone no and PAN no behind the cheque for receipt purposes. 2) By Wire Transfer (only through overseas bank), informing us at ruchikagoonj@gmail.com. Can also send their contributions through the Arpan Foundation website (http://www.arpanfoundation.org/about_us/donate.asp). Please mention clearly that it is for GOONJ. Can also send their contributions through the Asian Foundation for Help website (http://www.asianfoundation.org.uk/donations.html). Please mention clearly that it is for GOONJ. To offer whatever assistance we can in their time of need, Pankhudi Foundation is doing a collection drive for the victims of the floods. We are collecting money and other items that will be needed by the victims to now and in the coming months to re-build their lives. * School material- toys & games, stationary, notebooks etc. Material donations must be packed in plastic gunny bags to make storage and transport easier. All donations will be sent to Goonj for further distribution on the ground. The Goonj team recently visited Leh to do a basic assessment of the situation and have connected with local organizations to help the Leh victims. * Donations must be in the form of CHEQUES / DRAFTS ONLY in the name of “GOONJ”. We cannot accept cash. * All your donations are eligible for Tax Exemption under 80G. For receipts, please write the following information behind your cheques/drafts – Name, Address, Phone No. and PAN No. For donations please provide your details HERE. The last date for sending in your contributions is 10th September 2010. Goonj is a recognized non-profit with initiatives running across 20 states in India and several awards to their credit including ‘Indian NGO of the year’ in 2008. They played a huge role in bringing relief to the victims of the Bihar Floods in 2008 and the Karnataka and Andhra Floods in 2009. Thousands of people have nothing left of their possessions except for the clothes on their back. The students of Disaster Management of Panjab University in collaboration with the Ladakh Student Association (LSA) Chd is organizing a candle light vigil march to pray for the victims of the Disaster that struck leh ladakh and to raise funds for the same on 13th Aug… .. The march will begin at 5:30 pm. So all are requested to be at Student Center Panjab University on time. I as a student of disaster management and a member of LSA want to take initiation to make the Calamity that struck our motherland to make it a National Calamity so that we can get a funds not only from the National Calamity Contingency Fund but also from the MPs of the respective States from their MPLADS funds, AND i suggest it to all other Student Bodies too, so that we can pressurize the Center Govt at a large scale . The MP Karan Sing had already announced a donation of 50 lakh if it so happen.. May god bless all the victims who met their fate on that fateful night and give strength to the families and all of us to overcome from this tragedy. Student Center Panjab University on time. Its been three weeks since the flash flood struck in Ladakh. Over the last three weeks many Ladakhis outside from their homeland (US, Europe, Delhi, Chandigarh, Jammu etc) were actively as well as silently involved in relief campaigns. Moreover the Ladakhi students and youths who are studying/working outside Ladakh (Delhi, Jammu and Chandigarh) are actively involved in collecting donations in cash and kind and organizing campaigns. One such campaign was organized by Ladakh Student Union Delhi and they managed to collect Rs 5 Lakh and expected to touch approximately Rs 6 Lakh by 6th of September. On behalf of Ladakh students Union Delhi and Help Ladakh Campaign we would like to thank few of the contributors whose help, advices and significant assistance were very valuable during such a harsh time: Few names that I would like to take are Art of Living Delhi, Major Vinod Kumar, Ka Rigzin Samphel, Rahul IAS institute and Rishi. On 29th of August (Sunday), Ladakh Student Association Delhi and Help Ladakh Campaign decided to donate an ICU ventilator to SNM hospital, Leh with the collected donation. The details and costs of the machine will put on the board shortly. We have already stopped collecting materials @ Ladakh Buddha Vihara-Bela Road because all the volunteers are students and also we will stop collecting after 6th of Sept. It was decided initially that the campaign would be carried out for one month. However we are silently continuing with the relief campaign by selling T-Shirt @ concerts, Cultural meets, shows, etc. T-Shirts will be available from tomorrow (i.e., 1st of Sept-@ Rs 250/ T-shirt). I was unable to update the designs selected for the T0shirts. Unfortunately we are left with only 200 nos of T-shirts. I would like to thank all the designers, particularly Prateek Sethi, Prakash Thapa and Tsetang Angmo for their conceptual designs. Contact Gyatso and Dawa for Tees. Those who would like to donate in kind please drop your goods at following address and we will be sending it by road transport as soon as we will have enough materials. Blankets and warm clothes would be in utmost need as winter is approaching and such clothings and blankets would be of immense use. To all the Ladakhi Students in Delhi. A meeting will be conducted at Ladakh Buddhist Vihara, Near ISBT on 15th August, 3.30 PM with all volunteers. In addition we will be distributing the donation booklets among the volunteers. We need more volunteers to work for relief fund campaign. we have already collected INR 23,000/- towards the ladakh relief. Thank you guys! We are leaving on the 13th Aug for Ladakh. Any form of contribution is welcome…clothes, food, monies. We are trying to rustle up some blankets, money, utensils etc to send to Leh which has been devastated by the flash floods and the best is to send this through the Samarpan Foundation. We have just returned from meeting Patrick, the faith healer who is attached to the Samarpan Foundation and is going to Leh to help the victims of the floods. Blankets, utensils, food, money is all required so if any of you would like to send something, contact Shraddha at 9810012062 or Deepa Nath at 9810116992. We are trying to rustle up all we can even through the travel industry and it’s a good time for us to help in whatever way we can. Aquaterra Adventures – Best of Himalayan Adventure Travel Collections are over 3 lakhs in 3 days, thank you all. The rest of you, come on, write that cheque and send them over. Ladakh needs your pen on paper. You can also contact Mr.Siddharth who is a theater artist from Mumbai . his number is 09768527862 , he is traveling to Ladakh with relief material . I have spoken to Siddharth , all you have to do is to collect your donation and drop it at his mothers place at Punjabi Bagh West in Delhi. In case u have collected Clothes , Food or Medical Aid , you may contact Mr .Harvinder Singh at 09811323625 in Delhi for Transport service to Leh . They are the oldest Transporters running on the Delhi -Leh highway for the last 35 years. Save the Children is coordinating its relief efforts with international medical humanitarian NGO Medecins Sans Frontieres and local NGOs in Leh. “Together with MSF, we are dispatching supplies of blankets and hygiene kits to Leh immediately. We are thankful to Jet Airways and Kingfisher airlines for airlifting the much-needed supplies to Leh,” Mr. Chandy said. People can call or SMS +918898619953/+91 9811320906. Alternatively, you can go to www.savethechildren.in to donate. As all you know there has been a major calamity in Ladakh, the most memorable part of the world, a place which has been engraved on every individual’s heart who has been there. This heavenly region has been devastated by heavy flash floods and mud slides. Many people have lost their lives and those surviving have lost their everything. And in a region where to grow a small plant takes lot of hardship, they have lost all their stock food and even the shelter of their homes! And the on-coming winter (with temperatures plummeting down to -20, -30deg Celsius!! ) makes matters even worse. In a region which shows no mercy to the weak, where the rule of ‘Survival of the Fittest’ applies the best, day to day survival is becoming a major challenge for these warm-hearted locals, let alone the mental agony they are facing. We, Isha Tours and Sahyamitra, have started working to help these unfortunate friends and their villages. We would like to request those of you who wish to or have already show willingness to help, to provide monetary help for them. 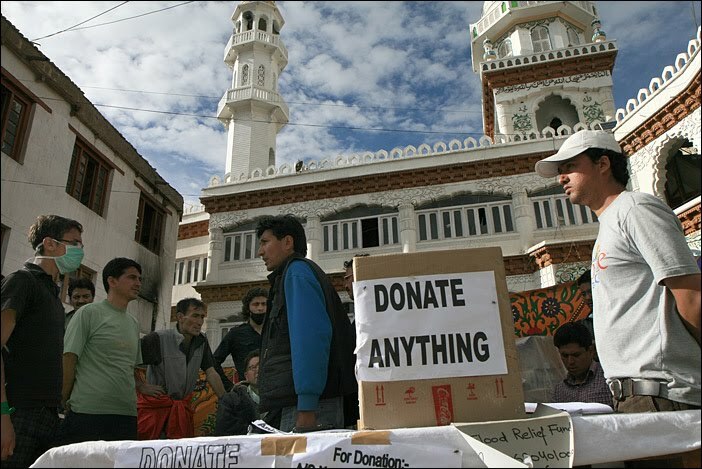 Some of you have offered to provide clothing and other necessities, but we advice otherwise as carrying them to Leh would prove difficult and they are or will be offered these by other groups. Whereas they are in need of money to be able to rebuild their house, buy groceries, utensils and other essentials as well as set up their farms and business (mainly tourist) now and later! One group and most probably Atmaram is also expected to leave for Ladakh next week. Prayers with the people of Ladakh. Another way to make sure relief gets to Leh… Through the LAMO Trust. LAMO stands for Ladakh Arts and Media Organisation (http://lamo.org.in) and my friend Sunetro works with them. You can send the cheques with your name and full address (and they’ll send you a receipt) to his hom in Mumbai and he’ll pass them on. We are setting up a relief fund to assist with the rebuilding of Leh, Choglamsar and the other affected villages. Also, Sonam Norboo Memorial hospital in Leh has lost all its equipment and we plan to help it get back into business. It once beckoned to us as a dream. Since then, ten years and a multitude of adventures later Ladakh has become an integral part of getoffurass and in a lot of ways has helped us define what we are today. The land and the people has ha…d a huge impact on the way we see and feel things. It has touched our lives and changed us for the better. The friends we made here are the ones we would cherish for life. To watch a calamity like this befall this land and its simple, beautiful, loving people has affected us a great deal. We have put together this event for raising awareness and doing what we can to help. With you, with us at this event we hope to reach out to as many people as we can. On Saturday the 14th of August we have organised an event to share, understand and explore on how we can help our friends, people and the place, to get over this devastating time. 1 Shanti Road has been kind to offer us the place to meet. We also plan to have an exhibition of images contributed from folks we know soon. Sale proceeds from the exhibition will be forwarded to Ladakh towards any kind of rehabilitation work. More about the exhibition to be posted on Facebook; getoff and onthemove pages. If you are in Leh or if you are planning to travel to Ladakh this year, please help the relief efforts by making a donation. Any contributions would be appreciated. Donation boxes will be placed around Leh. If in doubt, please feel free to contact one of the organisers, Juma Malik at Glaciers Travel, Old Fort Road (opposite Galdan Intercontinental Hotel and next to Fruit & Vegetable Market). The Redcross account no of Deputy Commissioner Leh. Pl donate generously and motivate others too for donation. For Flash flood Victims of Leh J&K. One thing about donating etc. is that the relief material should reach the people who are in need. The parts of Leh city which has been damaged is mainly the area of Skampari and the bus stand and Skalzaling and the Solar Colony at Choglamsar. The residents of these places are mainly from the middle and lower income group. They have left the villages and settled in Leh or have left rented houses and have made their own houses there. most of the construction has been haphazard as there have been no building norms. My main concern is that we have a plan for building shelters/ one room houses before the winter sets in. Water starts to freeze by the middle of October and no construction can be done. What we should plan is to help with the basic requirements like kitchen utensils, wood stoves (bukharis), firewood for winter heating and clothing for the harsh sub-zero winters. Winters are long from End of October to the end of April. May is also quite cold. Immediate help can be given but if we do some thing we should have it done with keeping that the people who have lost their homes are to face a very harsh and cold winter. This is because to construct homes for all in this season will be an uphill task but they can have prefab housing or make one room structures for the families. This we alone cannot do we can have people at Leh . I am just giving my opinion. Rigzin can call his IAS friends etc to help as they may have some other ideas. In the end of this we have two tasks ahead of us the interim relief and the long term relief for the winter. ible we need to send this to the peoples over dr. As i’m leaving for Leh on 14th Aug 2010. You can contact me for anything in Leh. I will try to do my level best for our people dr. Very Imptt to Note:- Doctors say even cases of post-traumatic disorder (PTD) are rising, So we need trained counsellors esp. who speaks ladakhi language. I hope lots of Volunteers will come forward in every single way to help the people and build their homes in coming days. Note:- If any1 of you have any kind of suggestion Plz dont hesitate to speak out. This is the time we can return something to our birthplace. A group of Ladakhi students, who belong to Kelibuk, Narchumg and Choglamsar villages of Thiksay area of Ladakh, said it had now become difficult for them to continue their studies and to meet their daily requirements in faraway regions, as they have to pay for their rents also. They said the flash floods in Ladakh might have destroyed agricultural lands and live stocks, which were the only source of income for their families. Many students who were due to receive money from parents could not get it due to the snapping of all means of communication between Leh and Jammu. Under such circumstances, these students have demanded financial help from the government till the time they are able to get support from their parents. They also demanded restoration of ATM services in Leh. The most urgent needs are food, blankets, clothes, temporary shelter and medicines. There is also an urgent need to think of medium and longer-term plans for restoring livelihoods and supporting communities to reduce the risks of such disasters happening in future. to re-construct peoples’ houses in Ladakh before the freezing winter sets in. More than 6,000 troops, the Central Reserve Police Force (CRPF) and police personnel along with the Indo-Tibetan Border Police have launched a massive relief and rescue operation. Six military aircraft,carrying relief material, rescue workers, doctors and sniffer dogs landed in Leh on Saturday 7 August. Two teams from the Union Health Ministry, including a public health expert, two anesthetists, two surgeons and two orthopedic surgeons with five tones of medicines, also reached Leh from Delhi on Saturday. Civilian doctors are currently operating from the army hospital as the only civil hospital in the area is submerged. The Border Roads Organisation (BRO) is trying to clear roads, highways and paths of debris and slush. CASA has local partners, including the Tibetan Relief Committee, to provide logistical and operational support. The Mountain Forum Himalayas, an apex body of NGOs working on issues of the mountain dwellers, is also lending support. Two senior CASA staff will reach Leh along with a representative of the Mountain Forum on 10 August to start setting up operations. and Moravian Mission School in Leh. CASA and LWF/LWSIT will be submitting proposals for a preliminary appeal within the next few days. 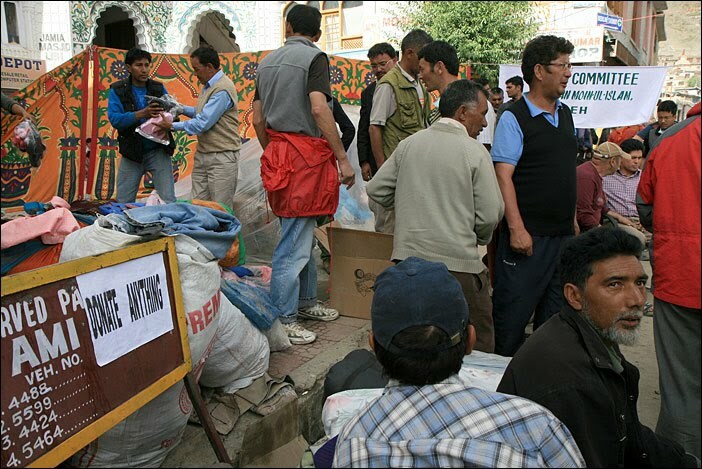 We appreciate for your kind support for the people suffering in Ladakh due to the natural disaster. Please write “Fund for relief and rehabilitation of flood disaster victims in Ladakh” as a reference and please let us know if you need receipt or not. MAIN BAZAR A/C No. 0069010200000128 CEC RELIEF FUND The account of the CEC Relief Fund is a current account. For international transfers and swift details, we suggest you to visit the link mentioned below on the website of J&K Bank Limited. Are you feeling helpless ? feel you cannot help? watch the video below.And pick yourself up!! and make a difference. Things that can be done immediately by all of us who are outside Ladakh especially those in Kashmir and Jammu is to send Recharge Coupons to Airtell and Aircell Numbers that you know. This will go a long way in helping those who are stuck up holding the sets in dearth of Talktime on their mobile phones. Things that are needed urgently include large size tarpaulins, about 20’x20′ which can be put into various use. It should be light weight yet strong to withstand tears and punctures from normal use. Silpaulin is the brand that has some reputation and not any other cheap types from Azad Market of Delhi.